Closing a sale is tough work. A lot of “experts” will give you some magic lines to say to bring the sale home. But we all know that a good one-liner isn’t going to magically close a sale for you. 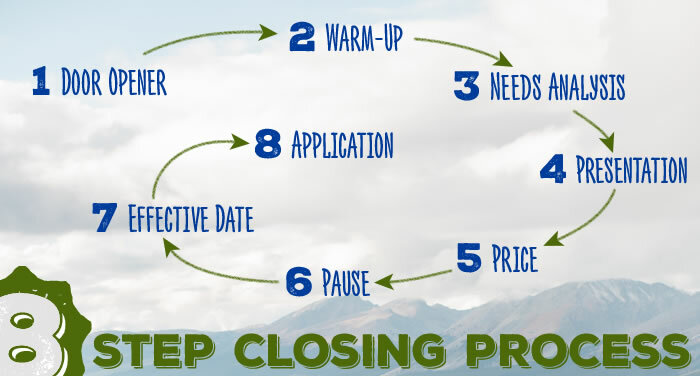 This 8-step closing process takes you from beginning to end. If you follow these 8 steps, you’re basically guaranteed to have a new friend by the time your close comes around. Now, this process was developed with door knocking in mind, but it can be used in any marketing situation. The first two steps are the most important part of the entire process, but once you get those down, the rest is a breeze. First up is the door opener. You’re trying to establish that you have important information to share. That’s it. They’ll press you to give more information on the porch, but don’t let that happen. Leave a cliffhanger, because that’s the only way you can get in the door. Right now, we’re using the plan changes (Plan F and Plan C being discontinued) as an ice-breaker. People want to know how that will affect them, and we can help with that. And trust me that the door openers above are exactly what you want to use. I’ve tried a million different things. You get desperate when your door openers aren’t working, but the one door opener that has worked consistently is the simple, yet effective one mentioned above. It’s a proven system, and it’ll save you from a lot of discouragement. Step one is the most important, because you can’t get to this step without it. But the warm-up is the second most important step of this entire 8-step process. You have to establish that you’re a good person. You’re not a scam-artist. When you get in the door, the client is uncomfortable. They just let a stranger into their home — of course they’re a little uncomfortable! It’s now your job to make them feel comfortable. In order to make them feel comfortable, you’re going to start the small talk. They have a John Deere blanket on their couch? You’re gonna talk about John Deere tractors. They have pictures of the grandkids on the wall? You’re gonna talk about how old they are, where they live, and what sports they play. They have a Cardinals sticker on their fridge? You’re gonna talk about the Cardinals. We have to get them to open up and talk. You can’t just come in and start blabbering about insurance. Here’s a little trick for you: F.O.R.M. If you don’t know what the heck to talk about, remember F.O.R.M. Ask about their family, ask about what they do for a living, ask what they do for fun or on the weekends, and find out how they like to spend their money. The agents that are the best in the industry are the ones that are great at the warm-up. There’s always an exception to the rule, but the best in this business really are the ones that find common ground with a prospect. They can relate to them on a personal level, and they get their prospects to open up. If you aren’t naturally good at small talk, you have to learn. It’s something you can practice. The more you do it, the easier it will become. Quick disclaimer: Know when to stop talking. You want the warm-up to last about 30 minutes. You’ve never met the person before, and you want to establish a foundation. That foundation can’t happen in 5 minutes, but an hour is just too much. The best part of all of this? You’ll meet some really interesting people, which makes your job that much more fun. Then, fill out that CNA. Fill out as much information as you can, and don’t rush this part. The CNA will allow you to learn everything you need to know about the client so that you can pinpoint the areas of concern. I used to just sell a Med Supp on that first visit. The next time, I might pitch something else. The next time, I might pitch something else. It seemed like every time I saw someone, I was just trying to sell something new. With the CNA, you find out every need, and you can point all of them out from the beginning. “Mrs. Jones, I’m going to learn everything I need to know, and there may be multiple needs that we need to address. So, you establish all of those needs on the first appointment, and your clients know that you will be bringing up those other needs later on. With the CNA, you uncovered the needs. Now, you present why that need is a need. Take the lead role and uncover the financial concerns. I usually use the carrier’s brochure as a guideline for this presentation. For the needs that are less important, give a little appetizer. But for the most important need, really delve into it and give a full presentation. The easy thing to do here is to just focus on the Med Supp, but it’s not always the right thing. Give two or three prices. Never give one. We recommend giving a low-end price, a middle-of-the-road price, and a high-end price. You can simply write the three options down on paper and show it to the prospect. And 9 times out of 10, the client will choose the middle one. When you show the prospect that paper (or whatever you’re using), don’t forget to pause. It’ll be uncomfortable, but don’t speak when you show the client the price options. Most agents talk their way out of the sale, and this is when it happens. So, remember to just pause. Be uncomfortable. And let them speak first. Tell them when the effective date will begin. I like to give myself about three weeks to process everything, so if it’s too close to the beginning of the next month, I’ll push it out to the next one. It does depend on the product, the time of year, and if there’s an e-app, but generally, three weeks is comfortable. Now, you can pull out that application, and start writing. I wouldn’t preach this system if it didn’t work. So, next time you want to pitch a product to a total stranger, remember your 8 steps, and you’ll be on your way to more sales, and, surprisingly, long-lasting relationships.